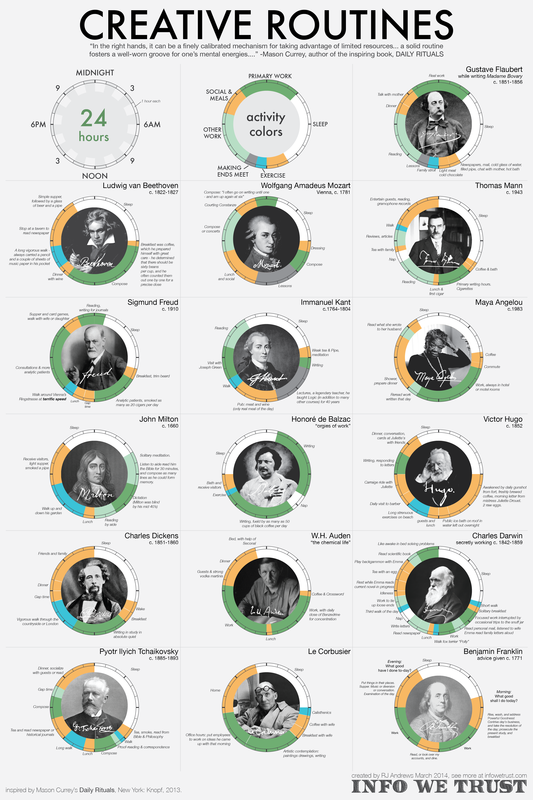 I came across this today, detailing the daily rituals of creative people. It’s fascinating to click on the poster and zoom in on one of the sixteen creative people highlighted to examine their routine. It made me think about my own routine, how I work best, and how I tend to work (they’re not always the same). I work best when I get a good eight-ish hours of sleep, exercise first thing in the morning (yoga, a slow run, or a swim are my favorites), then dive into work from my home office. I like to have long chunks of time to work, even if I might jump between multiple projects during that time. I’ll usually work until mid-day, then take a break for lunch or to walk to another work spot. I’ll work for several more hours, break for dinner or to meet friends, then do another hour or two after returning home. Those last hours tend to be my most productive. Maybe it’s because things are quiet (not many people are pinging me at 10 or 11 pm), or maybe it’s because I feel more energized. I typically don’t want to go to bed before midnight. And then I read. That’s my favorite way to end the day, to be transported to another world through a story. I know this is how I best work, yet it doesn’t always happen. Some mornings I wake up with so many things racing through my mind that I jump on the computer immediately, telling myself that I’ll just do “one more thing” before heading to the gym. And then one more thing turns into another and it’s lunch. I read somewhere that the best way to be effective is to create a routine in order to reduce the number of decisions you had to make. I’m probably botching the theory here, but it reasoned that you have more energy to focus on work/creativity if you aren’t expending energy deciding what time to wake up, what to eat for breakfast, whether to exercise in the morning or not, etc. I’m going to give it a try. See what decisions I can predetermine, to allow more creativity to flow. Happened to read this on my phone in my morning “check Twitter while half-asleep and still in bed” routine. I’ve always found that very early in the morning is my best time for creativity and writing for me (a coffee-less, pseudo-dream state at 5-8 am, which I’ve written about before). But that rarely happens, cause like you, I prefer 8-ish hours of sleep! What happens, then, is I go straight to my computer in the AM, then fall into work. I quickly lose that sense to let go and wander creatively, work through the day, and have recently fallen into a daily routine of boxing at 5 or 6. I thought *I* was the only person who checked email/Twitter/Facebook in bed upon waking! 🙂 I also enjoy writing on paper (I’m not sure I could call it a journal, because I don’t write in it regularly) as much for the physical act as for the thoughts that come when I’m writing (and not typing). Penning something feels so much more personal, just for me. Some mornings I wake up with so many things racing through my mind that I jump on the computer immediately, telling myself that I’ll just do “one more thing” before heading to the gym. And then one more thing turns into another and it’s lunch. I do this all the time… Wake up, stumble out to my couch, hop onto my computer, and next thing I know it’s 10:30 and I haven’t gotten off my couch. I think I need a better routine.